As the number of Oscar contenders that are sight unseen narrows to almost zero (basically David O. Russell's American Hustle and Martin Scorsese's The Wolf of Wall Street now, both of which are huge contenders in the race), many are turning their eyes towards the presumed smaller players that unveiled themselves at the recent AFI Fest. One was Scott Cooper's Out of the Furnace, which has been talked about as an under the radar awards hopeful (I'll be writing about that one soon), but the other was Peter Berg's war movie Lone Survivor. Many scoffed at this one having any real chance (particularly since it stars Mark Wahlberg and perpetual movie bad luck charm Taylor Kitsch), and Berg has yet to do much worthy of consideration, but some early reviews have this one potentially poised to make a mark. For anyone who knows nothing about this flick, it's a dramatic retelling of a true life failed military mission. It was code named "Operation Red Wings" and took place on June 28th, 2005. The title is Lone Survivor after all, so there's no use burying the lead: only one man made it out alive. Basically, a quartet of SEAL Team 10 members had a mission to capture or kill a notorious Taliban leader named Ahmad Shahd. 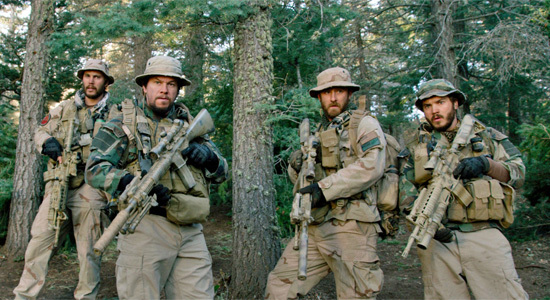 Things went very bad and ultimately Marcus Luttrell Wahlberg's character) was the only member of the team to survive. The other members of his team are comprised of Ben Foster, Emile Hirsch, and the aforementioned Kitsch. Eric Bana also has a part, while Berg serves as both writer and director. So far, just about everyone who's seen it has like it, with some even comparing it to Black Hawk Down as you can see in this review right here, which is possibly more than anyone could have expected. With Universal's only other Oscar pony (Ron Howard's Rush) not likely to show up anywhere besides the technical categories, the studio could give Lone Survivor a big time awards campaign and push based on this praise. They might have already been planning this, but I'm sure they're now starting to ramp things up as November begins to turn to December and the precursor season gets underway. Where could it hope to contend if the film continues to lead somewhat of a charmed existence? Well, obviously there's the hope for Best Picture, Best Director for Berg, Best Actor for Wahlberg, Best Supporting Actor for either Bana, Foster, Hirsch, or Kitsch, and Best Adapted Screenplay for Berg as well, plus possibly Best Film Editing, Best Sound Editing, and Best Sound Mixing too. Director is probably wishful thinking, while Lead Actor is too jam packed for Marky Mark to likely sneak in, though who knows with Supporting Actor (though don't hold your breath). 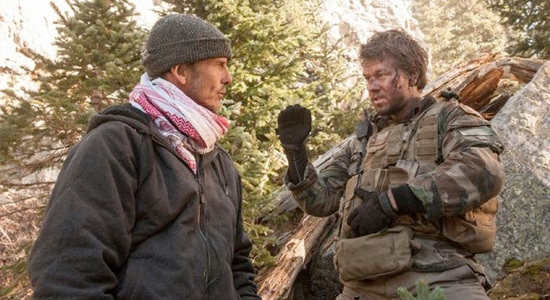 Basically, it's all about Picture and Adapted Screenplay in terms of Lone Survivor's Oscar hopes, give or take the Sound techs, with Best Picture actually being a bit more likely than Adapted Screenplay, if you can believe it. What works for the film is that it's somewhat of a tearjerker, but since it's about war, it doesn't feel quite as manipulative as other flicks that seek to make you cry can feel. That's where some number one votes come from, and how a movie can potentially sneak into the Best Picture lineup. I'm not saying that it will, but it's clearly an X factor in the later stages of this race and well worth keeping in mind. Stranger things have happened, that's all I'm saying. I'm honestly contemplating calling Lone Survivor for a Best Picture nomination in my next set of predictions, which is coming in a few weeks. It'd be a very rare situation, with a movie getting only one nomination, and in the biggest category no less. That being said, it could wind up happening for a few different ones this year, so Berg's flick has at least a fighting chance at making it happen. Lone Survivor won't be out until the very end of December for a qualifying run, with a wide release in January, so the release date strategy certainly points towards an awards campaign. Will it wind up paying off? We'll see in a matter of months, but this is one dark horse/X factor that few thought much about earlier this year, but really should now. Excuse the pun, but Lone Survivor might prove to be just that in the end. A lot will depend on the presursors, but I could see this one getting a few key notices in a Black Hawk Down sort of way. Yes, Taylor Kitsch deserves a Best Supporting Nod for this, he is incredible as Lt. Murphy. Michael's father said on facebook: Daniel J Murphy Taylor did a great job in his portrayal of Michael and probably deserves an Academy Award as best actor because his portrayal of Michael was so accurate, it was uncanny. As Michael's father I was in the best position to see Taylor's uncanny capture of Michael's essense, personality and character. He, along with Mark Wahlberg who portrayed Marcus were able to capture that special bond between Michael & Marcus and the friendship between them. It is a great movie. It's much better than The Hurt Locker...a bad movie that somehow won Best Picture. WTF? It's got Emile Hirsch in it, so I'm there. Doesn't seem to have an award worthy cast, so the writing and direction must be extra good then? Stranger things have happened, but I really don't see it happening. This year is pretty packed as it is. Maybe the nominations in the sound categories, that's about it. Looking forward to seeing it now though, the trailer didn't do it for me. Not gonna lie, I got a heterosexual man-crush on all four lead actors. Too bad the title kind of spoils most of their fates. It's good. Best SEAL movie ever made IMO. This is Peter Berg's new calling card. Hope it gets more attention. More people need to be aware of the story and what SEALs do on a daily basis for the sake of each other and country, no matter your politics. I'd say it's even better than Black Hawk Down and Hurt Locker just because it feels more intimate with just the four characters. You don't go chasing your tail trying to figure out who's who, you're just there with those four guys and you never wanna watch anyone else.